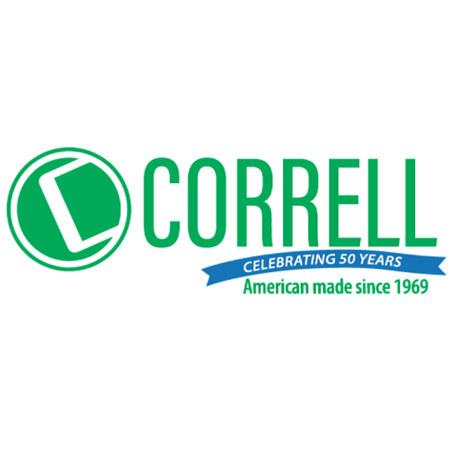 Correll has been producing folding tables, folding chairs and furniture storage carts for over 40 years. They have an extensive selection of commercial duty folding tables for use in schools, churches, offices, prisons and public event spaces. For lightweight folding table needs, Correll has the popular blow-molded plastic folding tables that are easy to handle and clean as well as being resist to damage from foods, crayons, markers, paints, chemicals and stains. Their light weight folding tops are supported by strong steel ladder frames and legs designed for commercial use. Look for Correll's plastic resin tables in standard folding table sizes, training seminar folding table sizes, and in colorful plastic resin activity table shapes for the classroom. For a smoother writing surface in classic wood grain finishes, Correll makes a number of high pressure laminate folding tables that again feature the same commercial grade steel frames. For extra top strength select Correll's plywood core folding tables or honeycomb core folding tables. High pressure laminate school activity tables in variety of classroom colors are adjustable and come in a range or popular table shapes and sizes. For the computer lab, Correll keyboard height computer tables are just the right height for keyboard class. For standing work such as sorting and food buffet lines, Correll's counter height folding tables get the job done. Now that you have selected the perfect folding table, you need a table truck or table caddie to store and transport your tables. Buy Correll's round table trucks and rectangular folding table caddies together with the folding tables to save with combined shipping. Correll also has injection molded plastic folding chairs and folding chair racks and carts for storage. For lunch break rooms, order a Correll cafe table, available in several sizes and shapes. Most Correll furniture products have a 3-5 day lead-time and carry a 5 year warranty.